Here is a unique spectral effect that creates organic chord progressions, tasty melodic textures, or ambient drones out of almost anything. Hexonator is built upon six melodically tuned resonators which isolate and emphasise matching frequency components in the incoming signal. With its chord sequencer, it makes it possible to "play" these resonators musically, producing fresh synthetic sounds that are full of life and character. 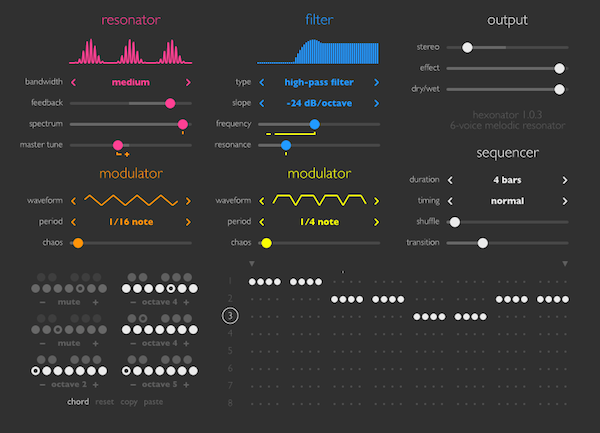 Hexonator also includes a multi-mode filter for final shaping, and everything can be animated using two powerful modulators with multiple waveforms and adjustable chaos. Just like with all Sinevibes products, Hexonator offers an incredibly simple, lightweight yet attractive user interface. It is comprised of high-contrast, colour-coded shapes for instantly intuitive operation. There are clever animations and transitions built in which makes the whole experience even more fun and engaging. Hexonator works with Logic, GarageBand, Live, MainStage, ReNoise, Reaper, Studio One, Digital Performer, Tracktion and other software that supports Audio Unit effect plugins. It comes in 32/64 bit format for Intel Macs running OS X 10.6 or later, and supports Retina screen resolution.